NAHA, OKINAWA PREF. - The Pentagon has reportedly dismissed a senior U.S. Marine Corps official in Okinawa following the leak of on-base surveillance video to a Japanese neo-nationalist group. According to Japanese media, Robert Eldridge, deputy assistant chief of staff of government and external affairs, lost his job over the unauthorized release of footage from a security camera located within the marines’ Camp Schwab base in Nago city, northeastern Okinawa. The leaked film, which showed the arrest of Okinawan peace campaigner Hiroji Yamashiro last month, was uploaded to YouTube on March 9. In response to inquiries from journalists in Okinawa, a U.S. Marine Corps spokesman initially denied the footage had been leaked. However, on March 14 the military admitted the video had been released without authorization and pledged to punish the party involved. Referring to Pentagon policy, U.S. officials refrained from confirming that Eldridge had been held responsible. Requests by The Japan Times for comment from Eldridge and the U.S. military in Okinawa have so far gone unanswered. Eldridge, a former academic, began working for the marines in 2009. Yamashiro, chairman of the Okinawa Peace Movement Center, was arrested by base security guards at Camp Schwab for crossing its boundary line during a demonstration on Feb. 22. Following his detention, he was handed over to Japanese police, who released him the next day while they conduct further inquiries. The arrest by security guards caused uproar on the island, since it was the first time that the Marine Corps has taken direct action against Okinawans protesting plans to build a new U.S. facility in Nago to replace the troubled Futenma air base in Ginowan city in central Okinawa. The surveillance video — which shows Yamashiro stepping over the installation’s yellow demarcation line — was apparently leaked to justify the arrest. The footage was uploaded to YouTube by a user called “Tedokon Bogii,” who is believed to be a presenter for the far-right Internet TV network Channel Sakura. Dubbing itself a Japanese culture channel, Sakura’s programs regularly glorify Japan’s role in World War II; they also claim anti-base protests on Okinawa are the work of Chinese, Korean and communist agitators. 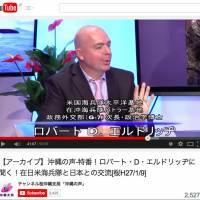 Last month The Japan Times revealed that Eldridge had appeared on Channel Sakura twice — including one appearance in January where he branded Okinawa protests “hate speech.” In comments on The Japan Times website, Eldridge also referred to Okinawan demonstrations as “mob rule” and claimed there had been “many physical attacks on Americans” by protesters. 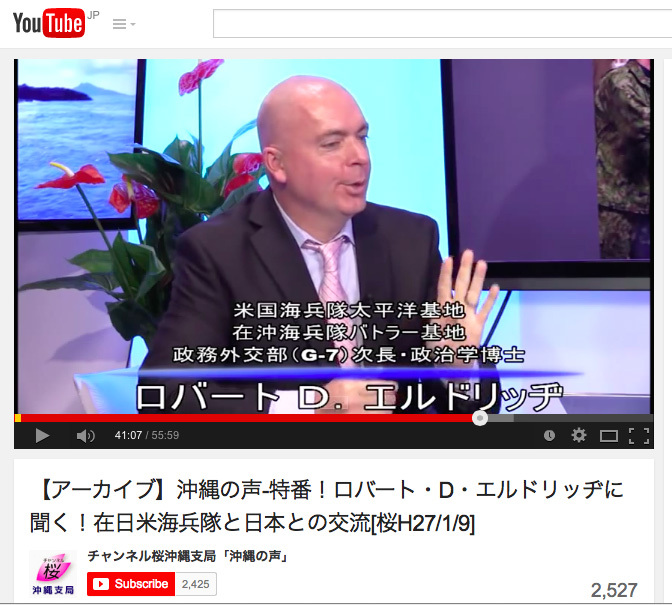 In December, Eldridge and a Channel Sakura host were invited to talk on the Pentagon’s local military radio network, AFN Okinawa. United States Forces Japan did not reply to requests from The Japan Times to clarify who had authorized the joint appearance; the issue is currently the subject of U.S. Freedom of Information Act proceedings. Revelations of collaboration between the U.S. military and Japanese neo-nationalists come at a critical time for Tokyo-Washington relations. Next month, newly appointed U.S. Secretary of Defense Ashton Carter is expected to make his first visit to Japan to discuss, among other matters, the long-stalled Okinawa base relocation plan. The Japanese government insists it is committed to the project despite overwhelming opposition in Okinawa. On Saturday, 3,900 demonstrators converged on Nago in one of the largest shows of Okinawan anger to date.